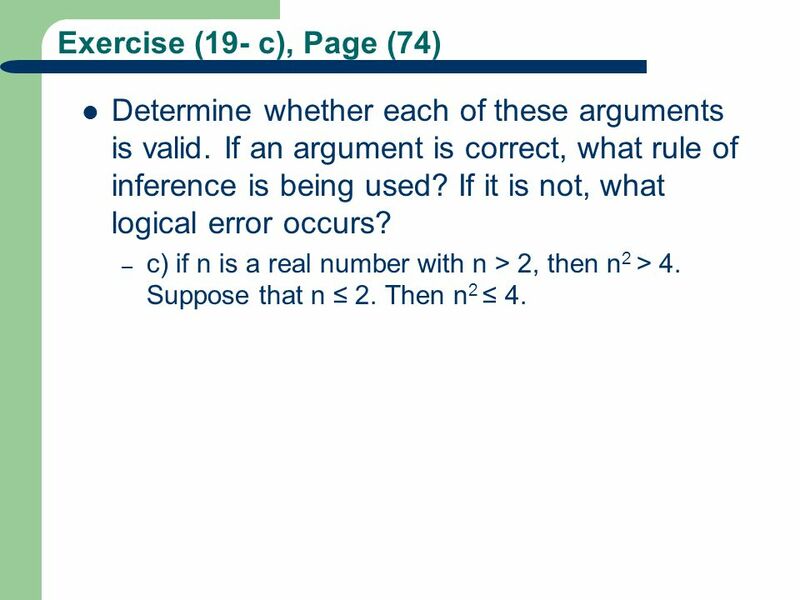 2 Exercise (19- c), Page (74) Determine whether each of these arguments is valid. 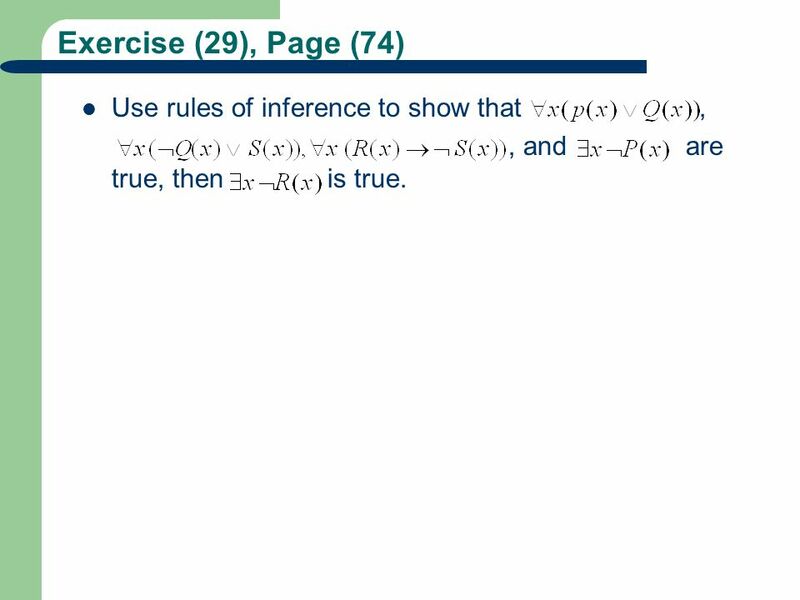 If an argument is correct, what rule of inference is being used? If it is not, what logical error occurs? c) if n is a real number with n > 2, then n2 > 4. Suppose that n ≤ 2. Then n2 ≤ 4.
, and are true, then is true. 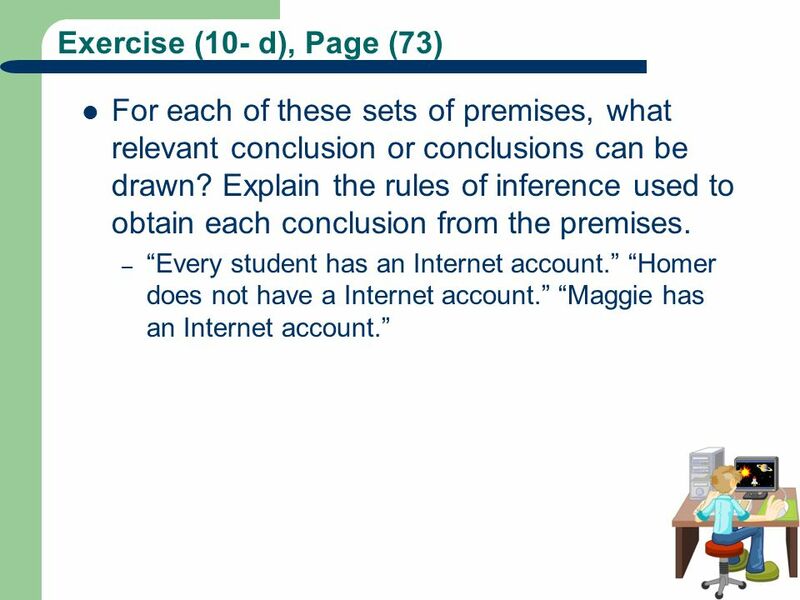 6 What rule of inference is used in each of these arguments? 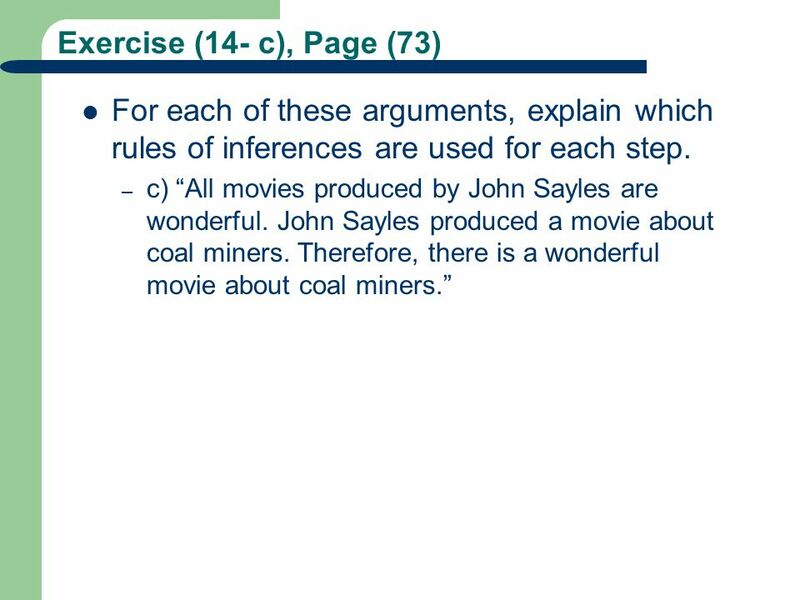 Exercise (3- b), Page (72) What rule of inference is used in each of these arguments? 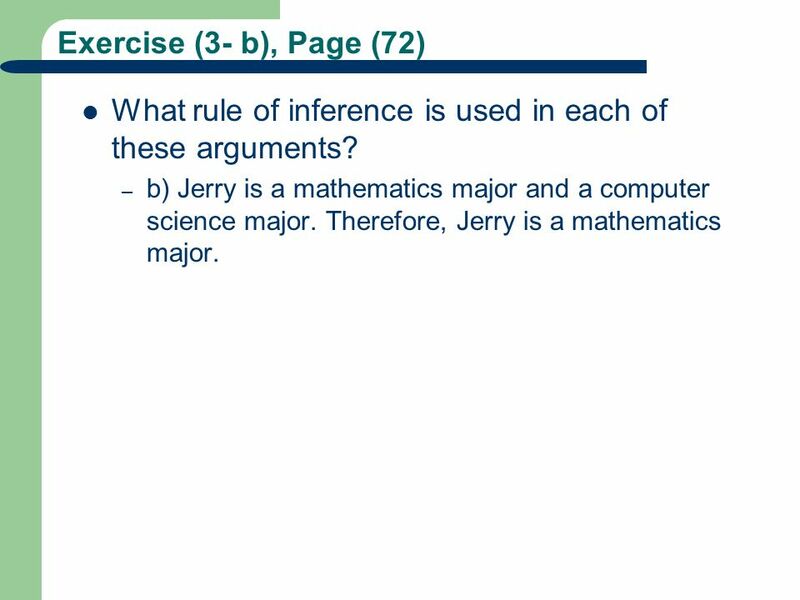 b) Jerry is a mathematics major and a computer science major. Therefore, Jerry is a mathematics major. 9 Exercise (15- c), Page (73) For each of these arguments, determine whether the argument is correct or incorrect and explain why. 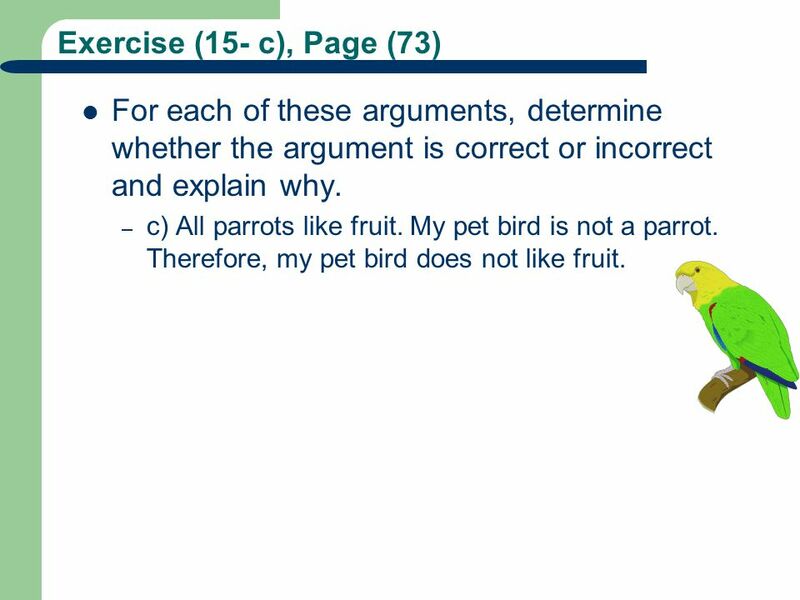 c) All parrots like fruit. My pet bird is not a parrot. Therefore, my pet bird does not like fruit. 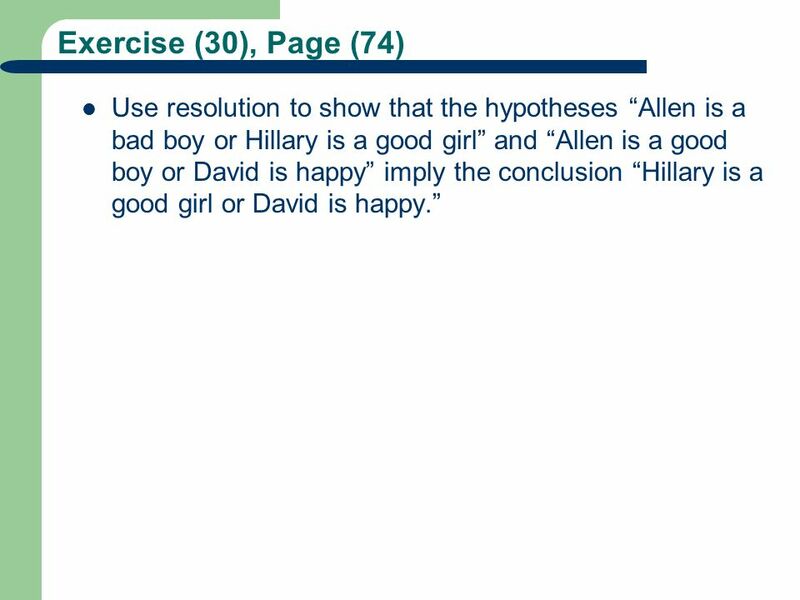 10 Exercise (35), Page (74) Determine whether this argument, taken from Kalish and Montague [KaM064], is valid. If superman were able and willing to prevent evil, he would do so. If Superman were unable to prevent evil, he would be impotent; if he were unwilling to prevent evil, he would be malevolent. Superman does not prevent evil. 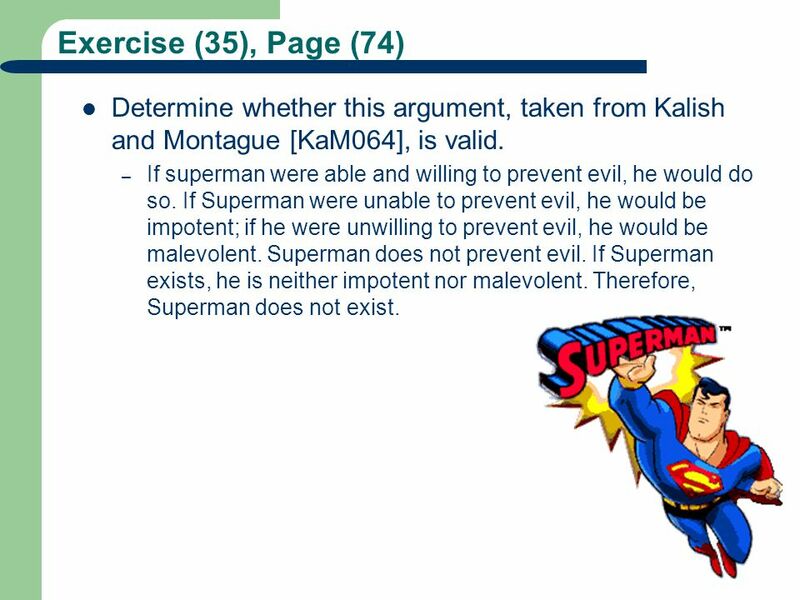 If Superman exists, he is neither impotent nor malevolent. Therefore, Superman does not exist. 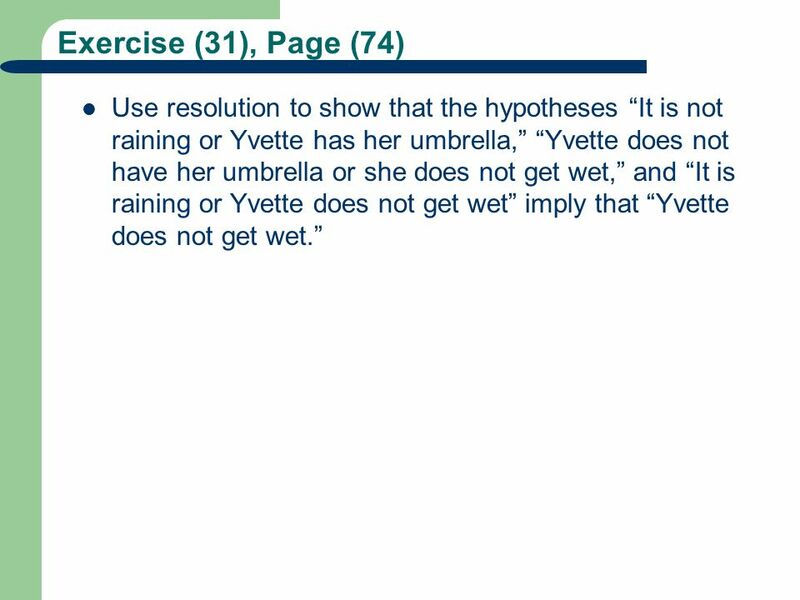 13 Exercise (16- b), Page (73) For each of these arguments, determine whether the argument is correct or incorrect and explain why. b) A convertible car is fun to drive. 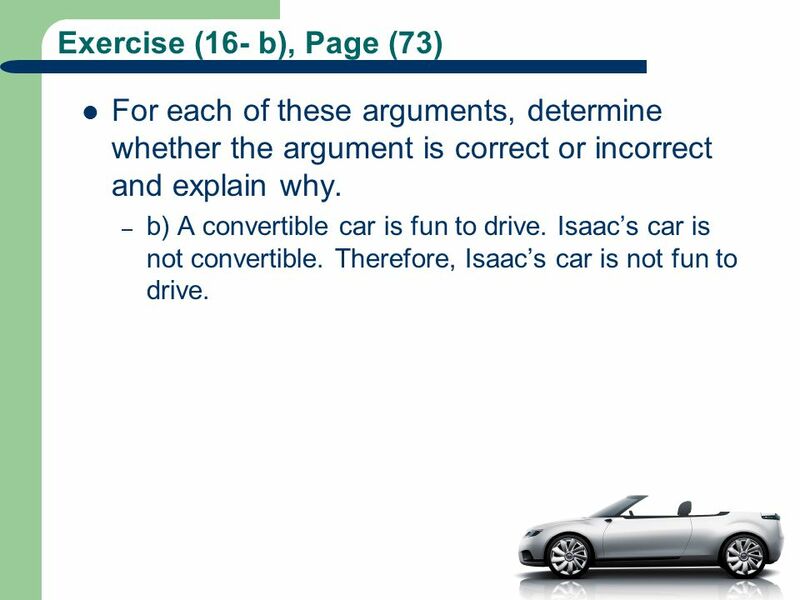 Isaac’s car is not convertible. Therefore, Isaac’s car is not fun to drive. are true, then is also true, where the domain of all quantifiers are the same. 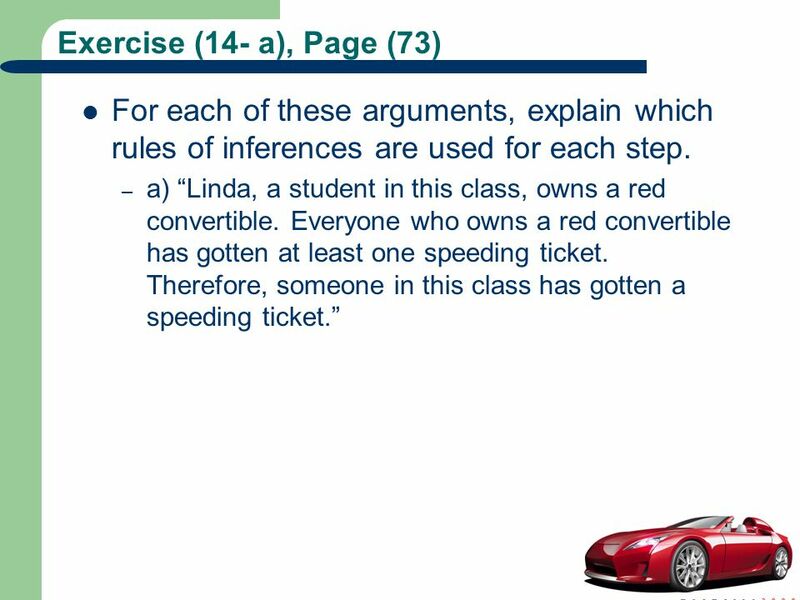 16 What rule of inference is used in each of these arguments? 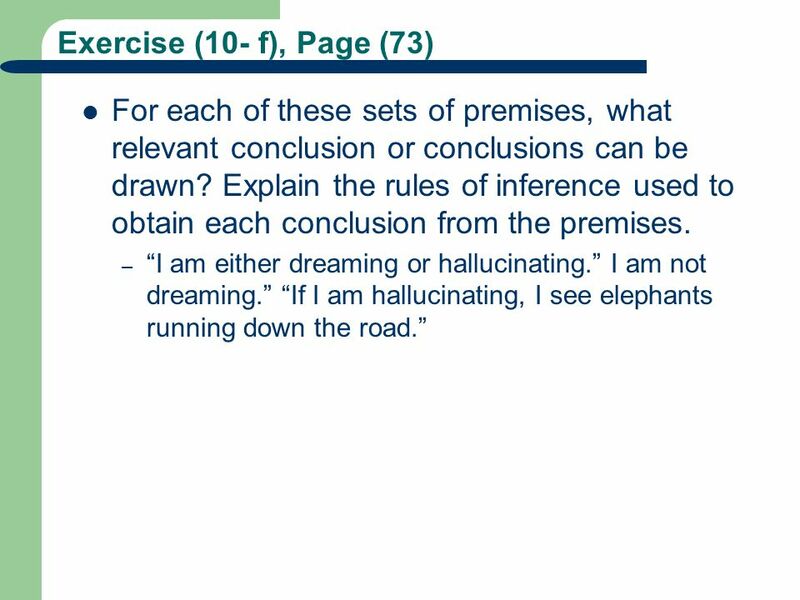 Exercise (3- e), Page (72) What rule of inference is used in each of these arguments? 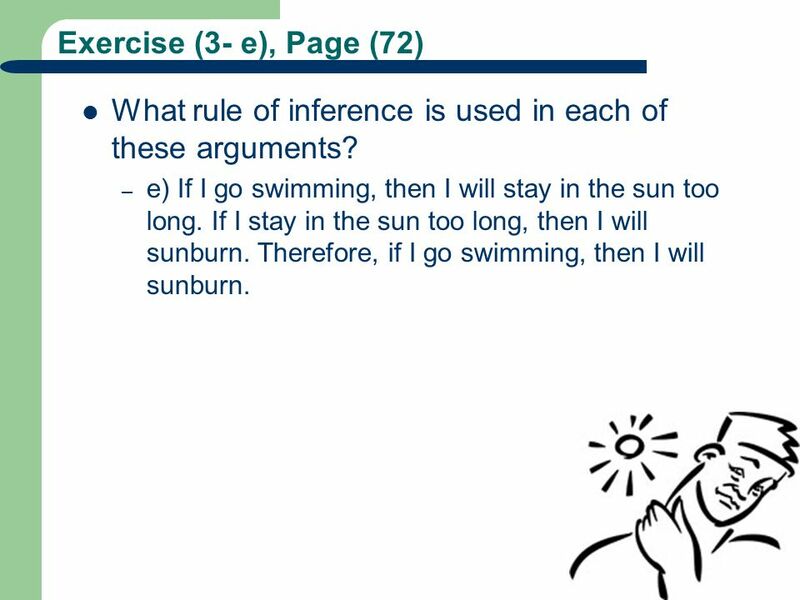 e) If I go swimming, then I will stay in the sun too long. If I stay in the sun too long, then I will sunburn. Therefore, if I go swimming, then I will sunburn. 19 Exercise (19- b), Page (74) Determine whether each of these arguments is valid. 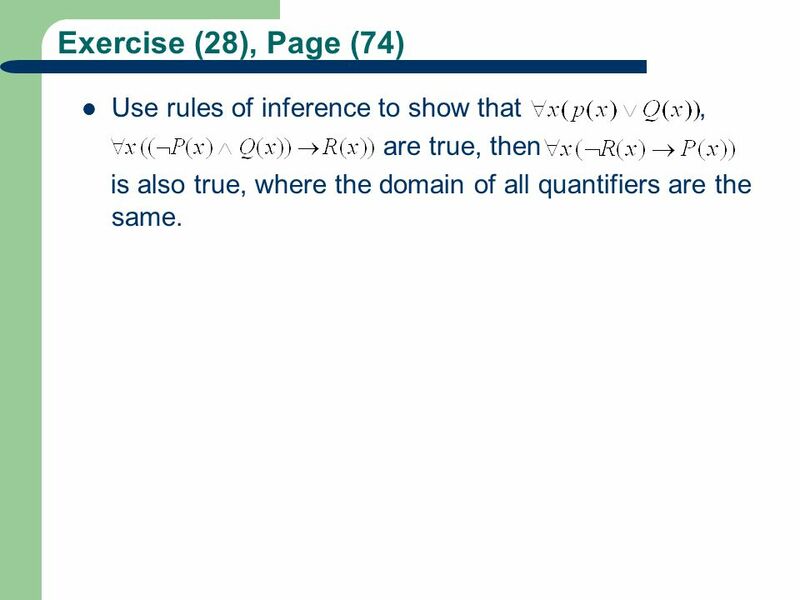 If an argument is correct, what rule of inference is being used? If it is not, what logical error occurs? b) if n is a real number with n > 3, then n2 > 9. Suppose that n2 ≤ 9. Then n≤ 4. 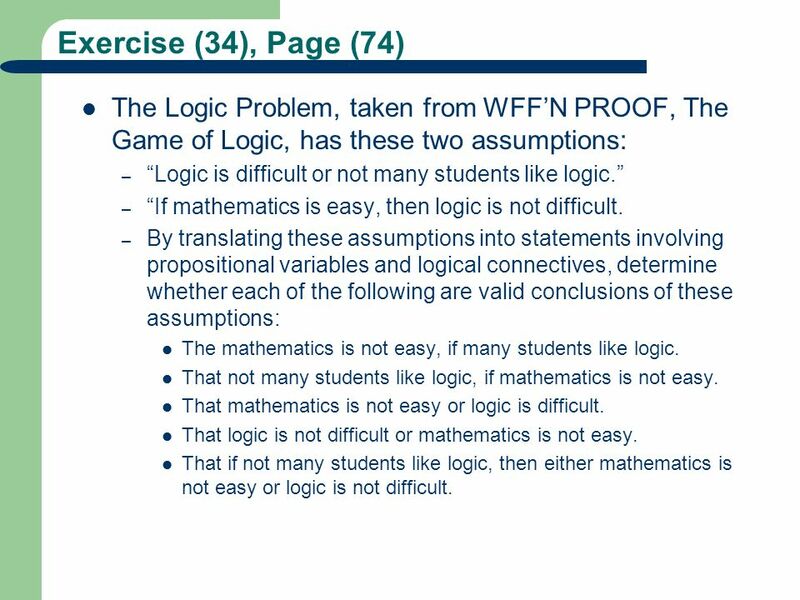 20 Exercise (34), Page (74) The Logic Problem, taken from WFF’N PROOF, The Game of Logic, has these two assumptions: “Logic is difficult or not many students like logic.” “If mathematics is easy, then logic is not difficult. By translating these assumptions into statements involving propositional variables and logical connectives, determine whether each of the following are valid conclusions of these assumptions: The mathematics is not easy, if many students like logic. That not many students like logic, if mathematics is not easy. That mathematics is not easy or logic is difficult. That logic is not difficult or mathematics is not easy. That if not many students like logic, then either mathematics is not easy or logic is not difficult. 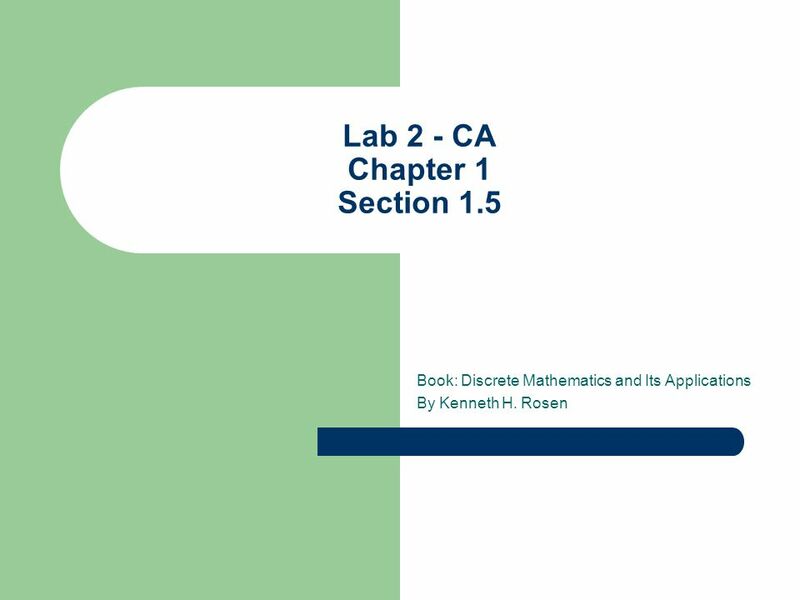 Download ppt "Lab 2 - CA Chapter 1 Section 1.5"
Rules of Inference Rosen 1.5. Discrete Mathematics University of Jazeera College of Information Technology & Design Khulood Ghazal Mathematical Reasoning Methods of Proof. Hypotheticals: The If/Then Form Hypothetical arguments are usually more obvious than categorical ones. A hypothetical argument has an “if/then” pattern. Announcements Grading policy No Quiz next week Midterm next week (Th. May 13). The correct answer to the quiz. 1 Valid and Invalid arguments. 2 Definition of Argument Sequence of statements: Statement 1; Statement 2; Therefore, Statement 3. Statements 1 and 2 are. 1 Section 1.5 Rules of Inference. 2 Definitions Theorem: a statement that can be shown to be true Proof: demonstration of truth of theorem –consists of. CPSC 121: Models of Computation Unit 6 Rewriting Predicate Logic Statements Based on slides by Patrice Belleville and Steve Wolfman. Moral Relativism, Cultural Differences and Bioethics Prof. Eric Barnes. CSE115/ENGR160 Discrete Mathematics 01/26/12 Ming-Hsuan Yang UC Merced 1. Valid Arguments An argument is a sequence of propositions. All but the final proposition are called premises. The last statement is the conclusion. The. T HE S CIENTIFIC M ETHOD. W HAT IS THE S CIENTIFIC METHOD ? Steps taken in a specific order to get an answer to a posed problem Steps include: Observation. 1 Discrete Structures CS Johnnie Baker Comments on Early Term Test. TR1413: Discrete Mathematics For Computer Science Lecture 3: Formal approach to propositional logic. 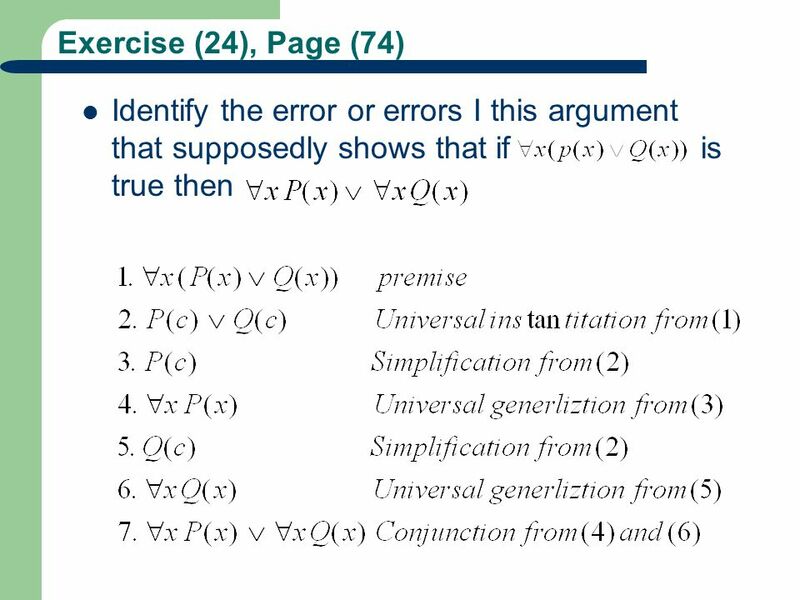 EE1J2 – Discrete Maths Lecture 5 Analysis of arguments (continued) More example proofs Formalisation of arguments in natural language Proof by contradiction. CSE115/ENGR160 Discrete Mathematics 01/17/12 Ming-Hsuan Yang UC Merced 1.